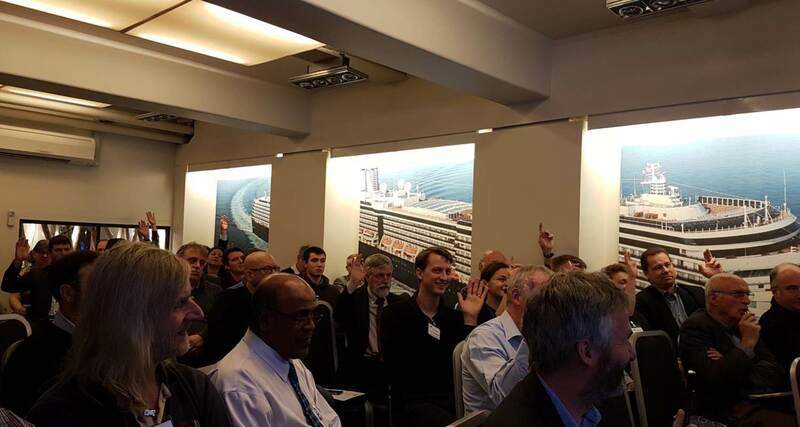 On 29th November 2017, 70 representatives from across the maritime industry gathered in Rotterdam with the common goal of exploring how to provide seafarers with the highest standard of port-based services and facilities. ISWAN’s Seminar on Ports and Seafarers’ Welfare, sponsored by the International Port Welfare Partnership Programme (IPWP), began with a welcome from ISWAN Trustee Andy Winbow, acting as the Chairman for the day’s proceedings. This was followed by a keynote speech from Karin Orsel (pictured), another of ISWAN's Trustees as well as Co-Chair of the Royal Association of Netherlands Shipowners and CEO of MF Shipping Group. Karin highlighted the good practices followed by her company, MF Shipping Group, along with challenges to the shipping industry, such as the fact that technical developments are now so rapid that regulation cannot keep up. Delegates were given an overview of the IPWP and its basis in the Maritime Labour Convention (MLC 2006) by Sharon Coveney (Deputy Chief Executive of the Merchant Navy Welfare Board), Captain David Parsons (IPWP Special Advisor) and Susan Newcombe (IPWP Special Advisor). A successful pilot project of 10 Port Welfare Committees (PWCs) in nine countries has led to a three-year programme aiming at establishing at least 30 PWCs. 66 countries have expressed an interest in participating, covering 158 ports internationally. The Port of Rotterdam’s Senior Advisor within its Harbour Master Division, Ingrid Romers, provided a case study of the port, describing how its development, location and industrial nature has had a negative impact on traditional seafarers’ welfare facilities. The port has recognised that its lack of public transport limits shore leave opportunities for seafarers and has established a fund to support the development of accessible facilities. The aim is to be a port that welcomes seafarers, not just cargo. Jan Oltmanns, Director of DUCKDALBEN International Seamen’s Club in Hamburg, began his presentation by welcoming ISWAN’s International Seafarers’ Welfare Awards, speaking as a winner of the Judges Special Award last year. He described his work in providing access to medical facilities for seafarers in Hamburg and emphasised that there is often a lack of confidentiality for seafarers experiencing health problems on board. The seminar continued with a report on the early results of a 2017 survey on the provision of WiFi access for seafarers in port, presented by ISWAN’s Project Manager Caitlin Vaughan. Not much had changed since an earlier survey in 2011, but results indicated an improvement in access for seafarers to ports’ own WiFi networks. Caitlin also highlighted the issues surrounding the purchase and use of SIM cards in port and the relatively high costs for seafarers to access internet-based services such as Skype. 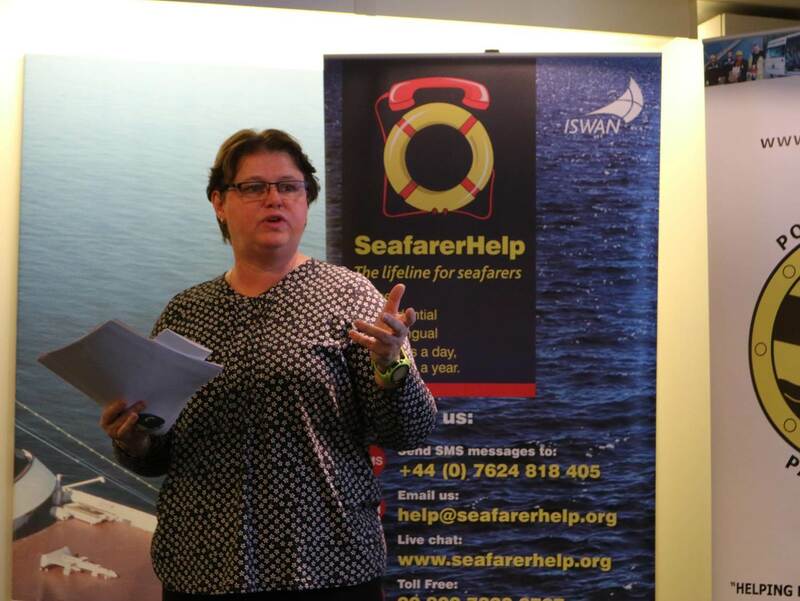 Next, Kimberly Karlshoej, Consultant to the ITF Seafarers’ Trust, demonstrated with statistics how little-used port-based welfare facilities were by many seafarers. She highlighted the number of good apps available to provide support to seafarers, along with the development of a Maritime Welfare Workers course in conjunction with the World Maritime University. Kimberly then introduced a new concept – a Portable Communications Pod which could be easily transported to and set up at suitable locations to provide seafarers with access to the internet. 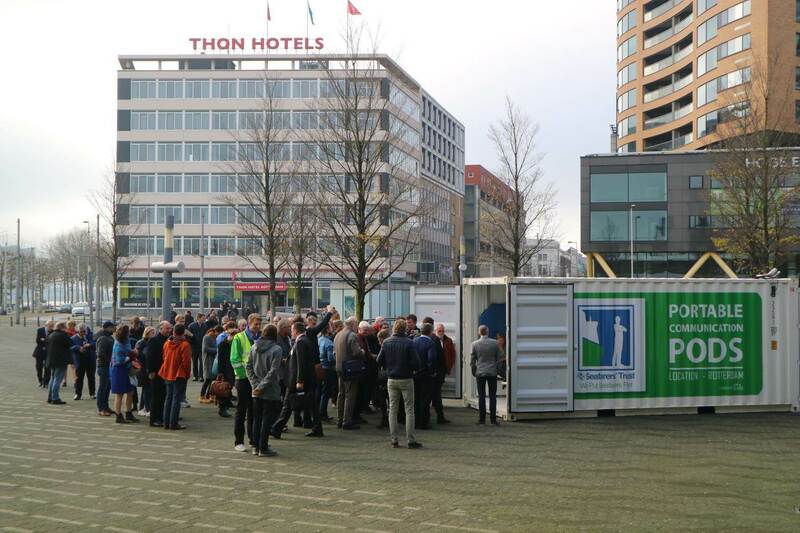 The delegates were then taken outside the venue to view one of these pods (pictured), which had been transported to Rotterdam especially for the seminar. After a champagne toast to the launch of the Portable Communications Pod project followed by lunch, the seminar resumed with a presentation from the North American Maritime Ministry Association’s Executive Director and General Secretary of the International Christian Maritime Association, Jason Zuidema. Jason expressed the view that adequate funding was critical to success and highlighted the benefits of collaboration through Port Welfare Committees. He also demonstrated the advantages to be gained from sound branding and adopting best practice. Dr Iven Kramer of the Port of Bremerhaven and Werner Gerke of the Seamen’s Club ‘Welcome’ Bremerhaven gave a joint presentation, using Bremerhaven as a case study. They stressed the positive benefits of ISWAN’s International Seafarers’ Welfare Awards and explained how the Bremerhaven Welfare Committee is a key meeting place for port-based organisations. The voluntary port levy system has been widely taken up, with some 85% of Bremerhaven port users contributing. They reported that adaptation to changing circumstances is important and the growing competition between ports is adding to pressures for resources. Lena Dyring, Assistant Director of Cruise Operations at the Norwegian Seafarers’ Union, spoke to delegates about the responses received when cruise ship crews were questioned about welfare provisions in cruise terminals. Time pressure, particularly on turnaround days, was a particular barrier to crew getting ashore. Shopping, transport and the ability to eat out and go on activities or excursions were all identified as cruise ship crew needs, as was access to WiFi, preferably free. The final presentation was given by Toon van de Sande, Director of Spiritension. He spoke about bullying and harassment of seafarers, which he described as toxic behaviour that can be just as serious whether it is real or perceived. Giving examples of available guidance for seafarers to combat bullying and harassment, Toon drew attention to the need to take into account cultural differences such as the varying physical and emotional responses by different nationalities. Summing up, Andy Winbow highlighted two issues which would require further consideration: better promotion of ISWAN’s activities and better links and coordination with port health authorities. The speakers, attendees, organisers and sponsors were thanked and all were urged to keep up the good work in support of seafarers’ welfare and wellbeing in the future. Photos from the seminar can be viewed here.